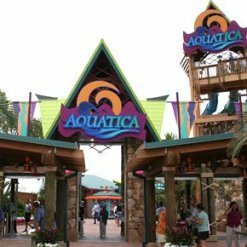 Here's a few directions to Aquatica you might find useful to get a feel of the surrounding area, before you start your holiday to Central Florida. A good idea here is to bookmark or print the relevent directions. The water park is centrally located 10 minutes south of Orlando on International Drive, opposite SeaWorld. Use junction 71 on the I-4 if travelling from the south or junction 72 if you're coming from the north and follow signs to Aquatica, SeaWorld and Discovery Cove. If you are located on or around International Drive and you are coming from the north, follow these directions to Aquatica and travel down International Drive until you pass the Orlando Convention Center on your right, from there follow the road until you see Aquatica on your left and SeaWorld on your right, look for the sky tower with the American Flag on top. If you are travelling along International Drive from the south, follow the road until you see the intersection for Central Florida Parkway, go straight over here and you will find the park a short distance on your right. If you already know or want to know where your staying in the Orlando/Kissimmee area, please use this useful Google road map search box.....Great tool to pre-plan your holiday or vacation before you leave home! When you're planning your visits to Orlando, you don't want to use old news and information. We will keep updating our site via our RSS feed. Simply click onto the RSS feed below our navbar and follow the instructions. It's an easy way to stay on top of what's happening in & around Orlando, free of charge, including updates for directions to Aquatica.